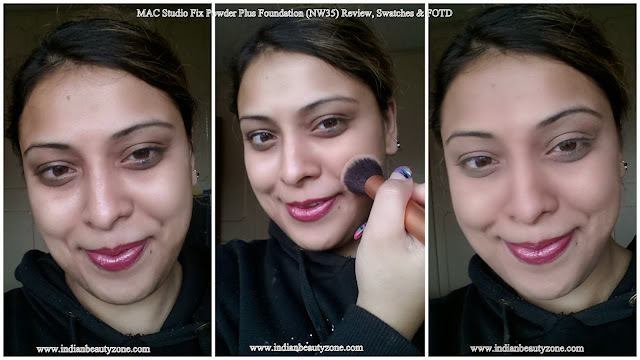 A one-step application of foundation and powder! Gives skin a smooth, flawless, all-matte, full-coverage finish. Long-wearing: lasts for up to eight hours. A real all-in-one! The choice of pros, and a long-time favourite of M∙A∙C fans! Few technical details first to understand NW and NC: NC stands for Neutral Cool and NW is Neutral Warm. 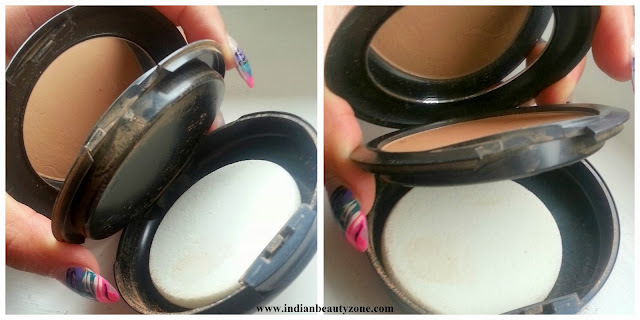 If you have Pinkish tone in your skin then you should choose NW shade foundations and for Yellow skin tone need NC foundations. You really need to take the time while selecting the foundation. Try it in natural light and on your face instead of arm while matching as it’s vital to find the right colour match with your skin. As I have pinkish skin tone, I was recommended NW35 by SA. I am quite impressed with this product. 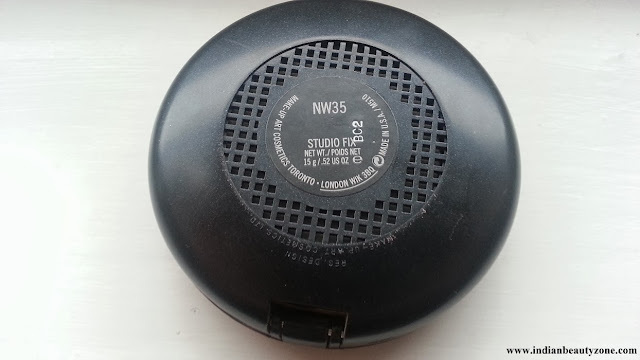 It comes in a nice satin black compact packaging with a good sized mirror and hidden part or compartment in the bottom that holds the applicator sponge. The sponge is good but I haven’t used it as prefer my RT buffed brush. The mirror is a plus point as can be used for touch-ups while travelling. It’s a smooth powder foundation combination. It’s perfect for me in terms of medium to full coverage, lasting power and finish. It is quick and easy, best for everyday use when you are in a hurry and need to leave for work early morning. This foundation covers all without looking like a mask. I love the natural finish it gives, which is matte but still look flawless. I don’t have to do frequent touch ups. It is good for normal to oily skin beauties, works best for oily skin beauties as it has silica which absorbs extra oils. 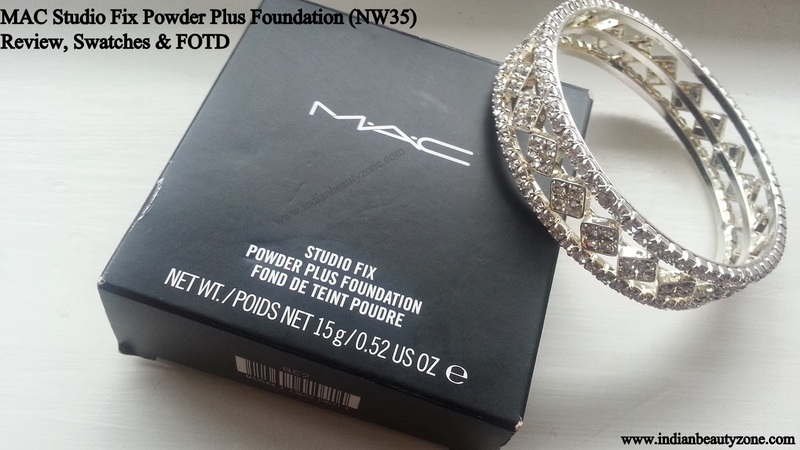 For dry skin beauties I would recommend using moisturization before applying this foundation to avoid patchiness. I have normal skin but in winter I found little dryness so prefer to apply moisturizer although wasn't required in summer. The powder is finely milled; does not contain any shimmer and has no fragrance. It evens out the skin tone very well and does not break out. It comes with a sponge but I don’t personally like to apply using sponge but would prefer my RT Buffing brush for lighter coverage. Also, using this brush the product applies more evenly and naturally. Using the sponge that comes with it can leave you with a really heavy unnatural look. 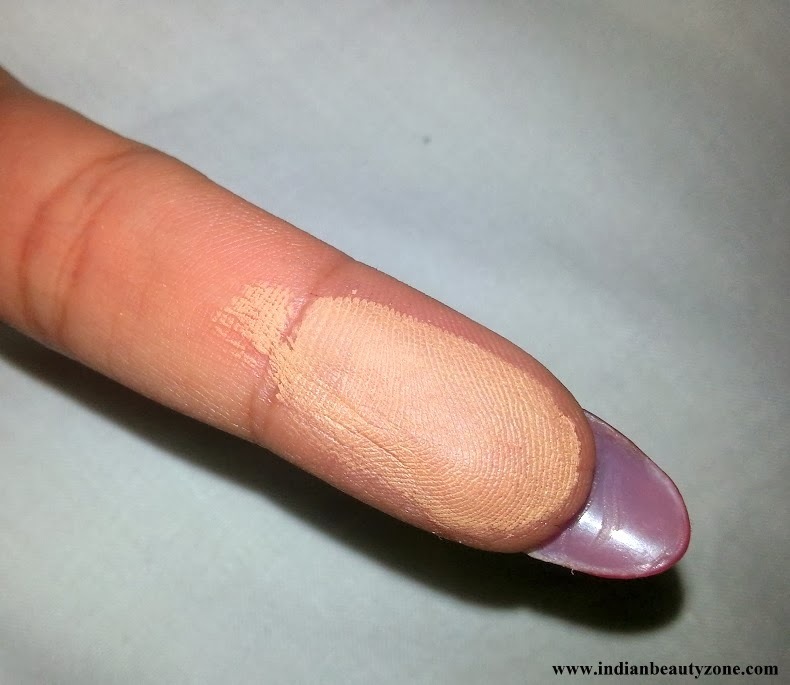 The coverage and pigmentation is superb. It is very good to cover minor spots, acne scars n redness. It does not cover or hide dark circles fully but works up to some extent. I prefer MAC Select Cover-up for dark circles. You feel very light after applying as allowing your skin to breathe without settling in pores. The staying power is really good at 7 to 8 hours but for oily skin beauties it controls oils for 4 to 5 hours. The Mac has an impressive range of shades so there is a shade for everyone. Those with very deep dark circles should use concealer before applying this for best results. • Those with very deep dark circles should use concealer as it covers only minor spots, acne scars and redness. 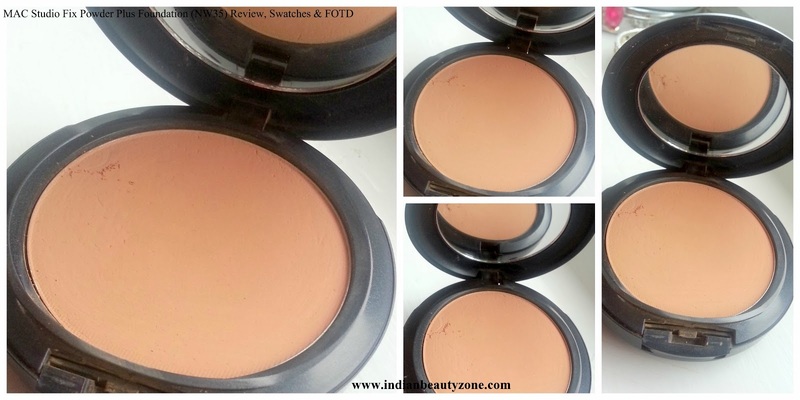 One of the best powder foundations especially for normal to oily skin beauties. 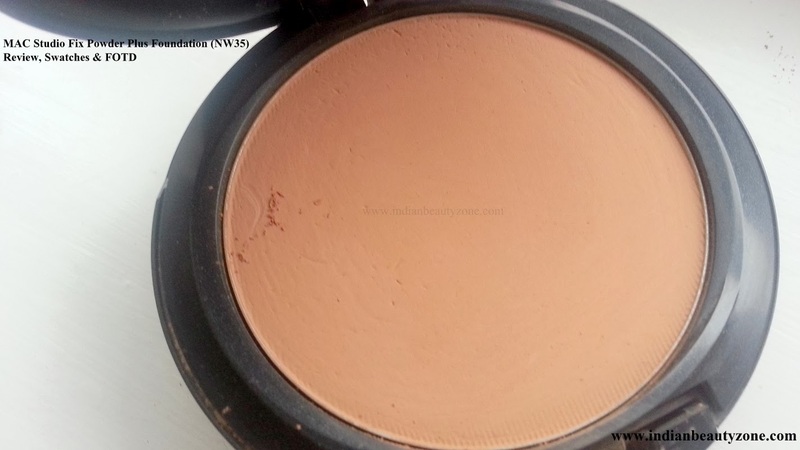 It provides good coverage and gives matte finish. It is a bit expensive but worth the price and highly recommended to oil skin beauties. I love its finish, coverage and texture. It works great as a concealer too but I use MAC select cover-up concealer to hide my dark circles. This powder plus foundation can give a beautiful finish if applied correctly, so I would highly recommend this foundation. indeed it is..u should definitely get this one jannat..
yes niesha i love the finish too..do give it a shot..
its good for combination skin as well.. Thanks darlin <3<3 Love !!! the foudation doesnt look that good for me as I have a dry skin.. :( but I would love to try Mac Face & Body. OMGsh lovely review dear ! It really gives flawless finish ! yes agree with you it gives a natural finish..do give a shot shreya.. Awesome swatches Tej, want to try it soon. yeah subha must get it.. I too purchased this foundation. While its expensive, I was satisfied paying for it. 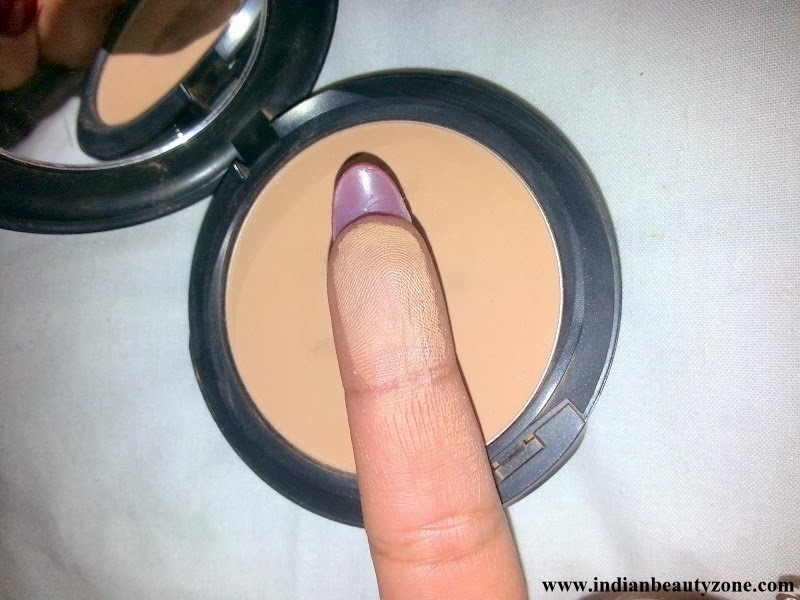 My shade is slighter lighter and blend well into my skin tone. 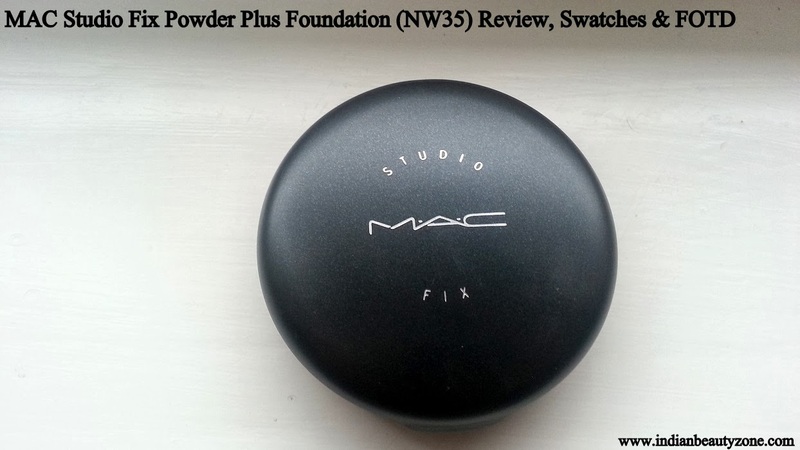 I love this powder foundation.... Mac is a great brand!!!! Happy monday my dear Tej!!! I love it :) and very nice pics. I love this product too! hehhe..u knw toa here i applied lipstick only nothing else..
itni sari mac lipsticks le li yeh kaise reh gaya..
Nice review Tejinder! Lovely pics you provide! yes u should get this one vips..its really good product for oily skin beauties..
You look gorgeous in the photos! Yeah I like liquid foundations too..
very very nicely reviewed dear. i actually fell in love with the product only by reading this post! :P but is it available in India? If yes,then whats the price? Lol..is pic mein kuch nai lagaya..
Nats this is must have product..do give it a try.. I am C6 and i too love it so much! you have an amazing skin even without the foundation dear!! Thank you for lovely compliment..
Love this stuff! This gives real nice coverage :) Nice review Tej..
U gotta such a lovely skin ...Firstly I couldn't differentiate before and after pic...detailed review!! very well written dear!! Thanks for the review..That is great..I have a studio fix concealor also and it works..